I know I’ve done Custard here before – but this is Lemon Brandy Custard. Made from my very own (well, Mrs Beeton’s very own) Lemon Brandy plus her regular custard recipe. Instead of using the custard as a sweet sauce for dessert, I used it this time as a topping for Baked Apple Custard (see Day 89). The instructions for putting together the custard in that recipe weren’t specified, so I played it safe and turned to her other custard recipe for guidance. As a flowing sauce or as a baked topping, it works really well. According to this recipe, you’re supposed to faff about with various saucepans full of boiling water etc. – but I decided to take a risk and just do it all in one saucepan, at a reduced heat. “Can’t hurt to try,” my boyfriend commented dubiously. To my great delight, it worked perfectly. 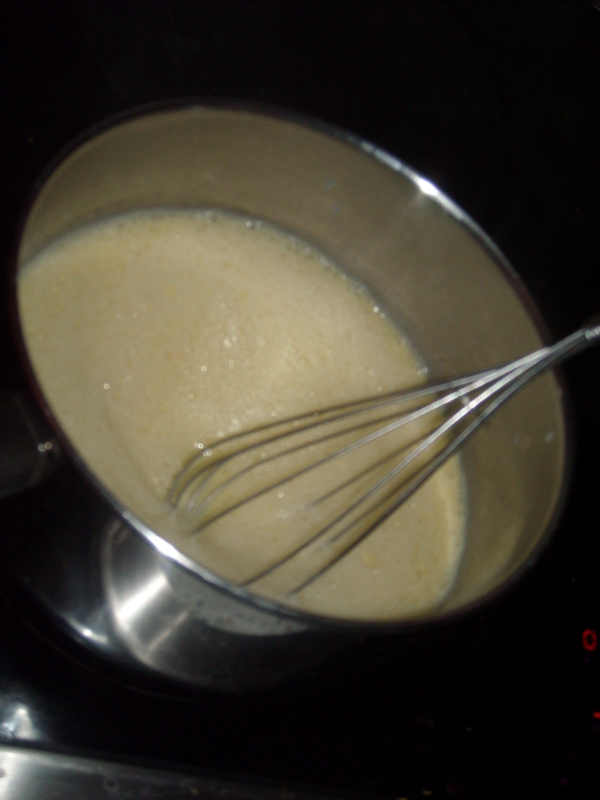 I had to continually whisk for a few minutes to ensure it wouldn’t burn, or clump, or whatever it is that custard does if it doesn’t work perfectly, but the frothy, thick sauce that greeted me at the end of 3 or 4 minutes’ worth of whisking made it all worth while. Normally when I decide to ‘cheat’ or take shortcuts with a recipe, the outcome ensures that I abundantly regret not listening to the author. This was the first time I could remember where cheating actually worked in my favour. However, as already mentioned in Day 89, my boyfriend complained that it was “too eggy”. I think at this point that I just have to accept that we’re always going to view food in totally different ways. I see it as something exciting, he sees it as fuel. But, at least I have the comfort of knowing, if he doesn’t like something, I can always blame it on Mrs Beeton. Well, sometimes, anyway. And, as I realised afterwards, two opinions about the same dish are far better than one – it makes the review more objective, if you will. This entry was posted on February 27, 2010 at 9:47 pm and is filed under food. You can follow any responses to this entry through the RSS 2.0 feed. You can leave a response, or trackback from your own site.